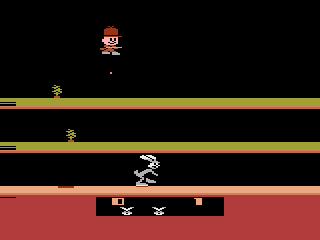 This is the rom image commonly seen on the web. 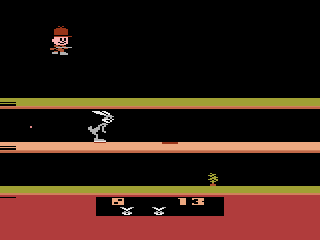 This version is playable, but is missing a few graphical details and gameplay enhancements that balanced out the gameplay in the final version. 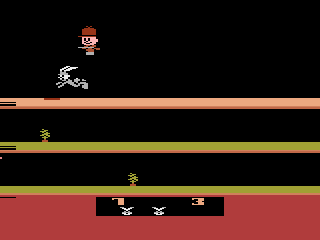 This version contains a bonus timer which is displayed in the lower left corner. After the hound finds you, the timer starts to slowly count down until you jump in the hole. This determines how many bonus points you get for completing that level. The intermission between levels is missing the hound chasing Bugs with Elmer. There is some extra animation and some extra sounds when Bugs misses the hole. The scoring in this version is much lower. The top row is worth 3 points, the middle 2, and the bottom is only worth 1 point. Extra lives are acquired at 100 points instead of 1000. There are safe zones on the extreme left and right sides of the screen where Elmer can't hit you. 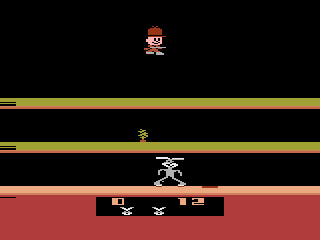 In the later version the safe zone on the far right has been removed and the safe zone on the left only exists on the lowest level. Even though Bob Polaro and Allen Murphy's initials appear in the code, they cannot be triggered. The left difficulty switch affects how fast Bugs moves in this version. The right difficulty switch does nothing. Elmers bullets will travel to the bottom of the screen instead of stopping at the level your on..
Be very quiet. I'm hunting wabbits! Eek! You got me Doc! He's rounding third and sliding into home! Maybe if they had made levels a bit taller Bugs could actually stand up!